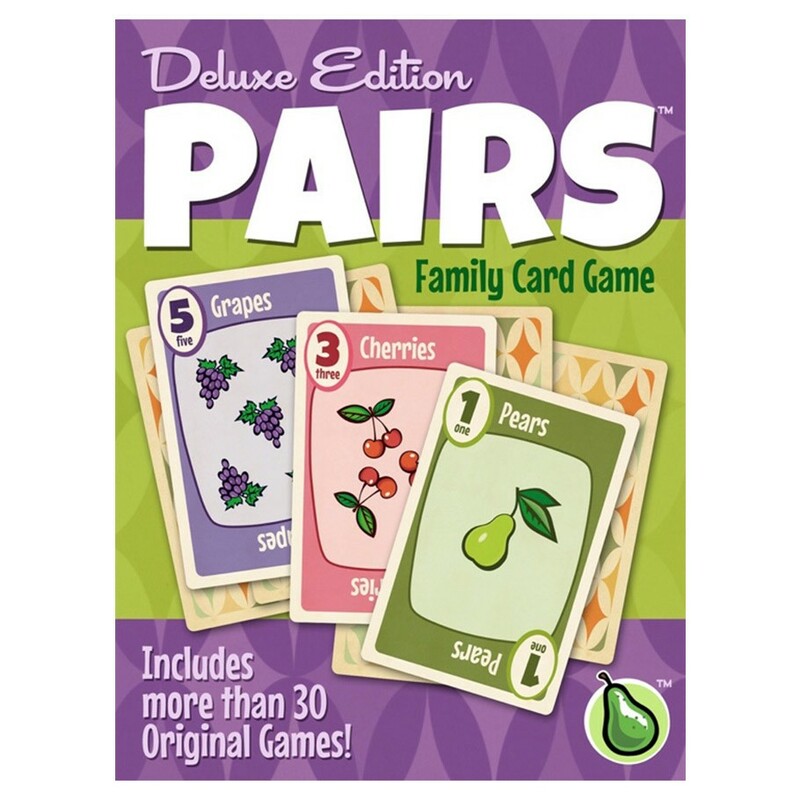 Pairs: Deluxe Edition is a game by James Ernest and Paul Peterson, published by Cheapass Games. It is for 2-8 players. In this deluxe edition of the game, players have over 30 different Pairs games and variations to choose from. The basic premise of the original game is to try and score the fewest points possible without collecting a pair of the same cards. The first player to reach the target score is crowned the loser. The rest of the players win. For more information on the original game and how to play it, please check out the link below. Since there are so many different games and variations that can be played with this set of cards, I won’t cover every one of them. Instead I will choose a few that I actually enjoy to kind of give you an idea of what you can expect from the game. As mentioned above, the basic game of Pairs can be played with this new deluxe edition. However there are a few variations to the basic game that are included here. There’s the Calamities variation where 7’s are bad luck. They count as lower than 1’s when determining who goes first and if a player is dealt one, the turn stays on them. Another variation is the Pieces of Eight. In this variation, 8’s are special. They allow the player to discard the 8 and take two cards as a third option of play. There are also variations of Pairs where players play for chips. In these cases, the player with the most chips wins. There are the Seattle rules where the loser pays each of the other players a chip. The Eugene rules where a player puts a chip into the pot every time they take a scoring card. At the end of this game, the pot is divided between the players with the lowest score. These are just a few variations. Next there are the other games that can be played with the deck. Many of these games require chips or some way of keeping score, just fyi. There’s Deadfall, which I’ve explained in a previous review of the game. This game is a bluffing game where the player is trying to either catch someone in a lie or to trick the other players into calling them when they’re being truthful. There’s the Judge which is a cooking contest where the players play cards to create a recipe in a cooking contest. The judge reveals cards from their deck to eliminate any recipes that match things that the judge doesn’t like. The last player standing wins and gains points equal to the face value of their recipe. The player with the most chips wins. There’s Rocket which is played a lot like blackjack, except that players are playing against the dealer and trying not to pair. Again, the player with the most chips wins. Lastly there’s Troll Guts. In this game players take turns drawing, stealing or buying a card. If they get a pair they lose and have to pay the value of the pair. The surviving player wins the pot of chips. The one with the most chips wins. These are just a few of the many games and variants that can be played. Of course for more information, check out the link below or check out the rulebook. This game consists of only a single deck of cards. Each card has a really nice finish that is quite smooth and easy to shuffle. I fully expected that with the glossy look, I would have to break them apart as they would be stuck together. That was not the case. Instead I got some really quality cards. The artwork has the same design as the original fruit deck, except that it has a retro style to it. There are different fruits on each of the cards from pears, peaches and cherries to onions, peppers and pumpkins. I really like the overall retro style look. Even more so than the original fruit deck. The game box is a little bit too big. It’s pretty close to the same size as the box for Get Lucky. The reason is because of the thick oversized rulebook. The box is big enough to fit it. That’s not a big issue but is easily understood. I will say that since several of the variants and games in the rulebook expect you to use chips of some sort to play, it’s mildy underwhelming to find that the game doesn’t come with any. After a bit of online research I found that the reason was to save on cost to the buyer and that the designer expected most players to already have something that they could use at home. As I said, mildly annoying but I get it. Still, for what you actually get in the box, I’m fairly pleased. The deluxe edition looks quite nice. The rulebook for this game is fairly thick. There are 45 pages worth of material. The book starts off with an introduction and a brief history of the Pairs game. From there it gives you the basics of the original game, followed by some variants on how to play. After a full on lesson into the game, the book delves into all the different games that can be played with the deck. Trust me, there’s plenty to keep you occupied for awhile. The book itself is quite nice. There are lots of pictures throughout the book as well as plenty of examples of gameplay. However, the pictures are all in purple ink, the same as the headings of each game and chapter in the book. I would say that it’s a little odd, but it kind of fits with the book itself so I don’t really mind it. The book is just the right size to fit nicely into the box and looks rather good too. With so many different variations and games to play in the book, you’re bound to find something that you enjoy. Needless to say, I think the rulebook does a pretty good job of providing plenty of information. It also looks pretty good too. Overall, I’m pleased with it. As I’ve mentioned before, there are SO many different variations and games that can be played with this deck using the rulebook included with the game. Needless to say, I haven’t begun to play every one of them yet. What I have found is several that I really like, some of which I covered in the overview above. I will say that calling this a deluxe edition was a little odd. While it does include a book full of games to play and a new set of cards to play with, that seems to be all that the game included. Most deluxe editions have fancy bits and baubles to really pimp out the game with, such as metal coins or wooden bits. There is really nothing like that here. While I enjoy the fact that the book has a lot of games to play, it just doesn’t feel like a deluxe edition to me. That said, I do like the original Pairs game. I especially like this new deck that the game comes with. I really like the way it looks. I have also found new games to play that I was unaware of, like the Judge and Troll Guts. I’m sure that anyone that enjoys the original game or any of the various variations found in the different themed decks available from Cheapass Games, will find something that they’ll like with this deluxe edition. It’s nice to have all those variations in a single book, along with some new games as well. I’m not going to say too much more about this game. All you really need to know is that if you like Pairs or any of the variants, you’ll like this one. You’ll also be happy with the companion book inside the game. I recommend this edition over all the others, simply due to the added companion rule book. Overall, it’s the best version of the game. 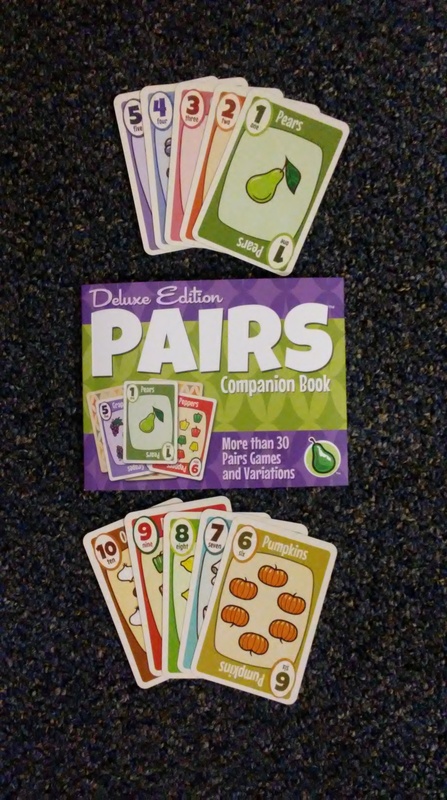 Pairs: Deluxe Edition is a new version of the Pairs game that includes a companion book full of new variations and games to play. It doesn’t take long to play. Most games last around 15 minutes or so, depending on which one you’re playing. Of course you can extend the game as long as you’d like to play or even shorten the game if you like. This deluxe edition contains a new card deck with lovely new retro artwork and a companion rule book that gives players plenty of new games to play, some of which have never been seen before. I really like the new artwork and book. I will say that it did surprise me to be called a deluxe edition and yet be missing out on the metal and wooden bits that most deluxe versions of games have. Still, I’m pleased with the overall look and design. I like the game and enjoy having the companion book. I would recommend this version of the game, especially if you’re already a fan of any version of Pairs. I will also recommend that if you’re looking to purchase a Pairs deck, it’s honestly worth the few dollars extra to get this version. Enjoy! For more information about this and other great games, please check out Cheapass Games at their site. This entry was posted in Reviews and tagged board, board games, card, card games, cheapass, cheapass games, deluxe, edition, ernest, games, james, james ernest, pairs, pairs deluxe edition, paul, paul peterson, peterson. Bookmark the permalink.